At the Nintendo Direct that occurred on this past Wednesday morning, Satoru Iwata revealed that the long-awaited April update to the Wii U will happen next week. Alongside the OS load time improvements and other new features is the official launch of the Wii U's Virtual Console. A surprising and out-of-nowhere announcement was that Earthbound would finally be hitting Nintendo's classic gaming marketplace. If that game can reach the Virtual Console, I wondered what other games could get that chance. I even listed games that really have no chance, but we can hold out hope anyway. After you've glanced at my list of ten games, why not write up some of your own in the comments section? I start off this list with a game that many, many gamers have been clamoring for. 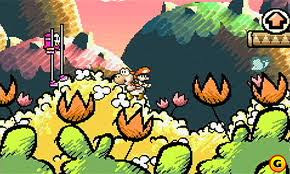 It's Super Mario World 2: Yoshi's Island. While the Game Boy Advance port of the game is available for Ambassadors on the 3DS, the SNES original has never been placed on the Wii Virtual Console, even after all of these years. Yoshi's Island is a remarkably well made game with excellent level design (every enemy, coin, and item placement serves its own purpose), terrific music, and charming visuals. 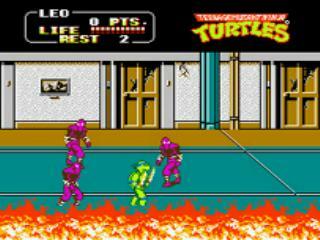 Here's hoping that Nintendo finally places the game on their Virtual Console. Maybe the Wii U is just the opportunity they've been waiting for. 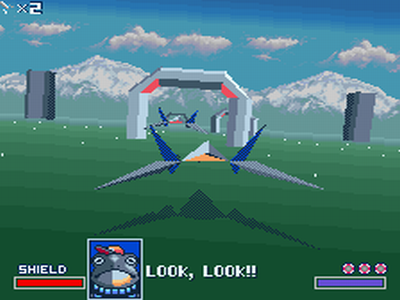 The title that introduced an animal space opera into the minds of many gamers, Star Fox was one of the first Super FX-enhanced games for the Super Nintendo, offering a 3D-like experience. The game contained three different paths to take, and each one had its own difficulty level and unique stages. Thus, there was a fair amount of replay value to be had with the game. The fact that the original Star Fox is not on the Virtual Console after so many years is worrying. Perhaps emulating Super FX games takes more effort than Nintendo has time for, but it would be great to see such titles like this finally arrive for players who never got to experience them to be able to. 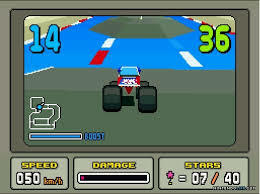 The second Super Nintendo game to utilize the system's Super FX chip, Stunt Race FX (known as Wild Trax in Japan) was a cartoony 3D racer developed by Nintendo EAD and Argonaut Games. The game had different classes of vehicles to race as, fully 3D tracks with overpasses, speed bumps, and elevations, and the gameplay was quite good. We haven't seen any Virtual Console games featuring games that needed the Super FX chip, which is a shame. 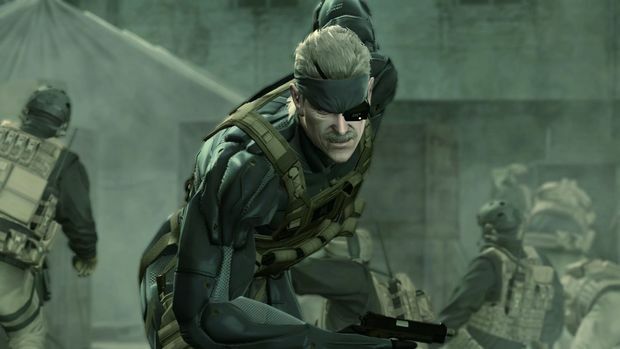 While they look incredibly dated now, the gameplay is still as great as ever. Here's hoping the Wii U's VC bucks the "no Super FX games" trend. 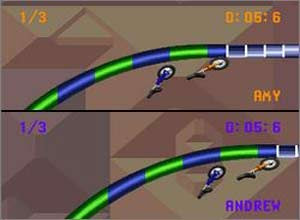 A game released by DMA Design (who would later become a little-known company known as Rockstar North) and Nintendo of America in an effort to show that the Super Nintendo could show games as fast as SEGA's Sonic the Hedgehog, Uniracers was a 2D racer where unmanned unicycles performed stunts to speed up and earn points. 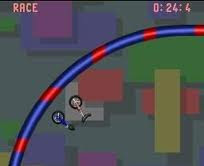 The game consisted of over forty unique tracks that offered their own challenges and difficulties. Unfortunately, my wish to have Uniracers on the Virtual Console is nothing but a pipe dream as the lawsuit that DMA Design faced from Pixar, due to their claim that DMA ripped off the rider-less unicycle idea from one of their short films, means that the game cannot be released. In fact, the original print run on SNES ended around 300,000 copies, making for a rare and much desired game. 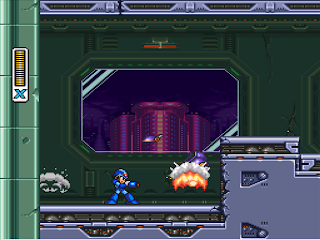 A rare Mega Man game on the Super Nintendo isn't just Mega Man 7 (which is another game that both of us at SuperPhillip Central want on the Virtual Console) is Mega Man X3, the third and final Mega Man X mainline game to launch on a Nintendo home console. 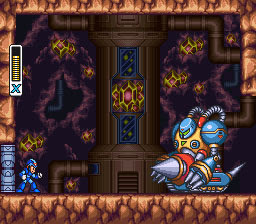 The game had Mega Man X and Zero (who could be a playable character for the first time in series history, though if he died he'd be gone for good) facing off against Dr. Doppler and his creations. 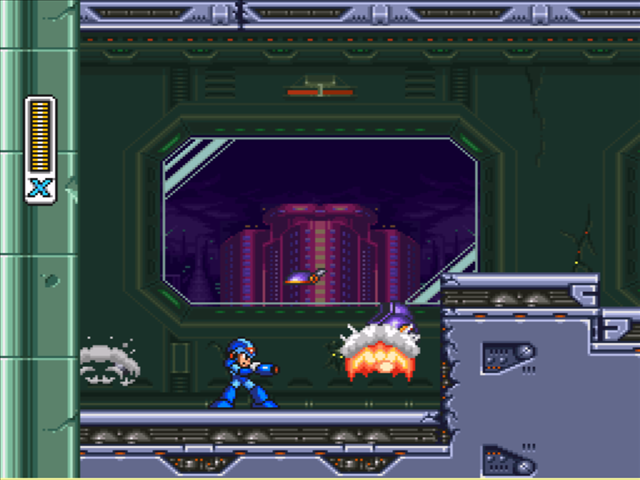 While the weakest of the SNES Mega Man X trilogy, Mega Man X3 is still a worthy game to play, and one that we cannot wait to show up on the Wii U Virtual Console, if it ever does. In North America, much like Pilotwings was a launch title for the Super Nintendo, the follow-up known as Pilotwings 64 was a launch title for the Nintendo 64, alongside Super Mario 64. This flight simulator game had players competing in various challenges to upgrade their pilot's license, thus giving them access to harder challenges and newer areas. From an island having a festival to a miniature mock-up of the United States, three different vehicle challenges were spread across these different islands. At this past week's Nintendo Direct, Satoru Iwata stated that Nintendo 64 Virtual Console games (along with Game Boy Advance ones) were on the way. 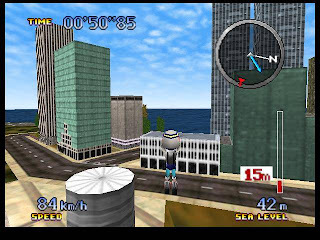 I'm hoping Pilotwings is one of the first new Nintendo 64 games included for the service. 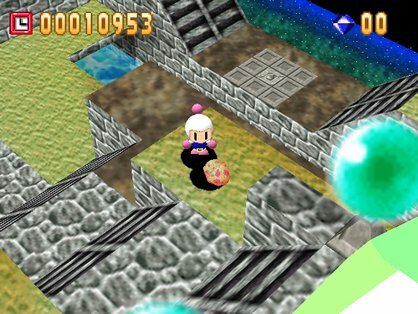 While I prefer this game's sequel, The Second Attack, to the original, Bomberman 64 is still one heck of a blast. Yes, pun most certainly intended. The game contained its own story mode set in six different worlds, each based off of a color. For instance, there's Green Garden and Blue Resort. Bomberman 64 was a bit tricky as it required players to cross chasms by bouncing across bombs. Very tricky stuff. It was still enjoyable, however. What was also enjoyable was the multiplayer mode, a facet of every good Bomberman game. This one had elevated arenas for players to obliterate each other in. Bomberman's future in gaming is bleak, as Konami subsidized Hudson, the creators and studio behind the character. 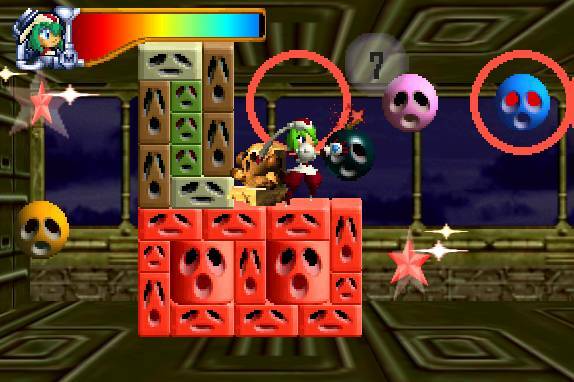 Who knows if they will allow such games from Bomberman's past to arrive on Nintendo's Virtual Console. We can only hope. A wacky and wild racer, Snowboard Kids allows you to shred powder down some fantastical courses, some not even related to snow. 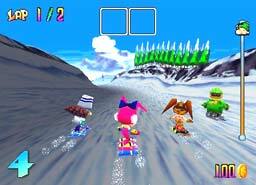 From amusement parks to cherry blossom-filled Japanese villages, Snowboard Kids offered a lot of crazy courses, nine in all. The gameplay itself was somewhat similar to Mario Kart, as players could use items to trip up opponents on their way to the goal. 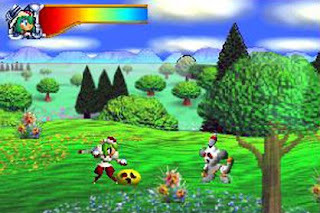 Here's a bit of trivia, the same developer of this game, Racjin, also developed Bomberman 64. How's that for some knowledge? 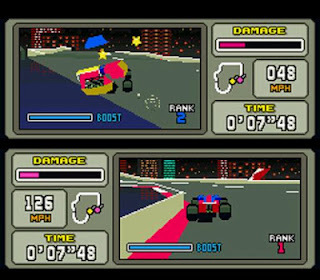 Regardless, Snowboard Kids was an exciting and atypical racer that needs to be put on the Wii U Virtual Console. As Stuart Scott famously declared, t's as cool as the other side of the pillow. The final game that I'd like to bring up is one that comes from the brilliant minds at Treasure. Mischief Makers was a game that mixed 2D platforming with 2D puzzle-solving to create one innovative and original experience. The heroine primary line of offense is grabbing enemies, objects, and even projectiles to chuck them back at foes. All of this added to something that was a breath of fresh air at the time, and one that still is a breath of fresh air. 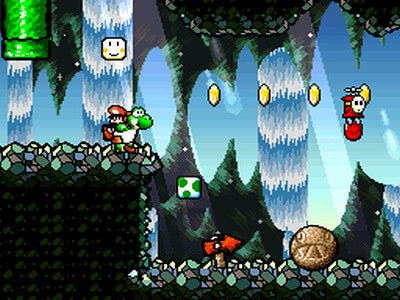 The Virtual Console would allow forgotten games like Mischief Makers to get another chance in the spotlight and allow more people to play games like this. All we can do as gamers is hold out hope. You've seen my preliminary picks of what I'd love to see on the Wii U Virtual Console. There's many more games that I haven't even touched on. What games would you include for a part two? We're doing double duty here at SuperPhillip Central on this Thursday. We posted an editorial earlier, but now we have a brand-new review. It's a shame that more sites didn't officially review this title, a graphical stunner from Shin'en. It's Nano Assault EX, and here's our review. Shin'en has a stellar track record on Nintendo platforms. 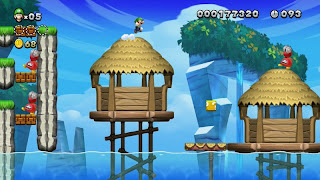 You might remember their earliest work with Iridion on the Game Boy Advance, the pair of Nanostray games on the Nintendo DS, and Jett Rocket and F.A.S.T. Racing League on the Wii. Released last year as a retail release, Nano Assault took the world of Nanostray and shrunk it down to microscopic levels. Now, the game has a second chance to shine, and this time it's a much more affordable and enhanced experience on the Nintendo eShop. Dubbed Nano Assault EX, do the extra features make for a game that's worth purchasing if you've played the original? 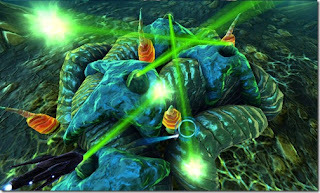 The basic goal of Nano Assault EX is to save the world from the Nano virus, and the only means to do that is to shrink your ship to microscopic size to root out the virus from each individual cell cluster, of which there are seven. 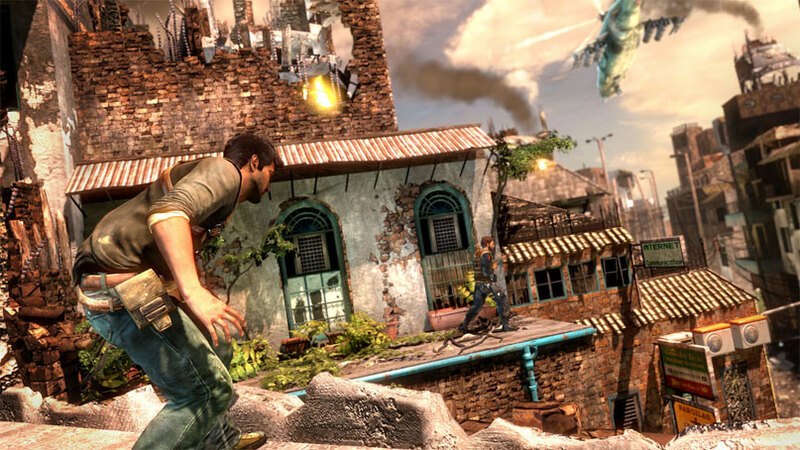 The story mode possesses over thirty unique missions spread across three types of play. The first you will come across are cellular levels. This is where you traverse a fully 3D cell body's surface, eliminating all enemy threats and collecting a handful of healthy DNA strands. 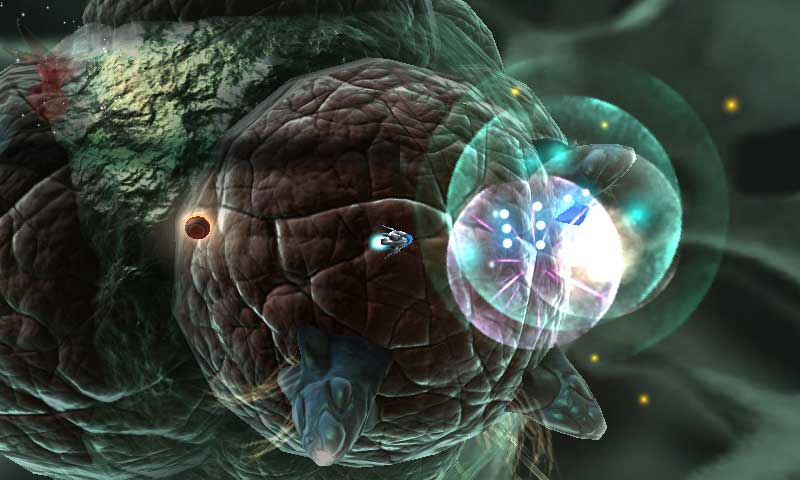 This is probably not an original observation, but it's almost a shoot-em-up version of Super Mario Galaxy, and how that game had planetoids very similar to how these cellular levels are in Nano Assault EX. Explore cell bodies and eliminate all hostile threats. 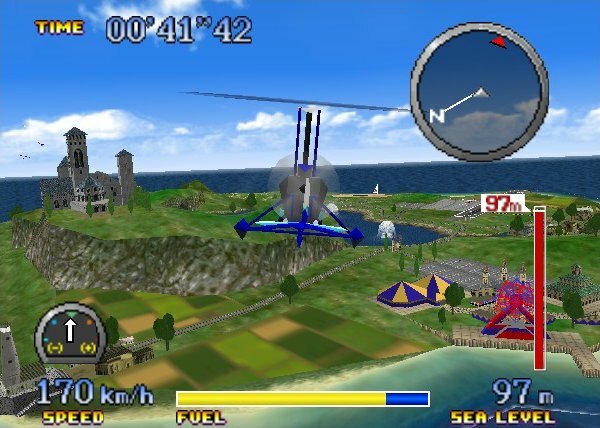 The second type of level is that of air combat. These are on-rails levels no doubt inspired by Star Fox and games of that nature. However, instead of hearing the banter between animal comrades, the only sounds you will hear are the whirring of your ship, the laser shots flying past your ship, and the music of the game. I enjoyed both the cellular levels and the on-rails levels, and found they both added nice variety to Nano Assault EX. 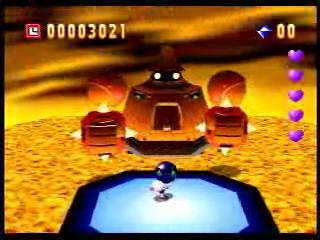 Nonetheless, there is still one more type of level that is unaccounted for, and that is the boss levels. Bigger is most certainly better, and Shin'en has packed Nano Assault EX with colossal confrontations (well, as colossal and big as a microscopic creature can be) that will test your bullet evasion and precision flying. This boss seriously bugs me. 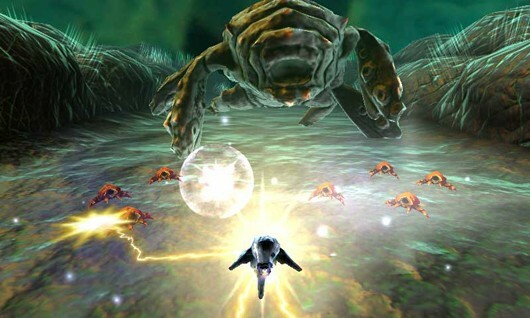 Nano Assault EX isn't the most difficult shoot-em-up on the market, but it is still rather difficult. You get but three ships to work with on each mission, and some levels, most notably the on-rails ones, are particularly long. Factor in the idea that you can't skip the short introductory cutscenes, and you have a minor annoyance. Regardless, the difficulty of the game may put off certain players, so know what you're getting into before you pay the $14.99 price tag (this review should be a big help). It's just a shame that you have to go through the Story Mode of Nano Assault EX to get to most of the other content within the game. It makes sense that Arcade Mode levels unlock as you beat their Story Mode counterparts. 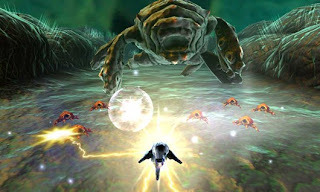 However, you need to invest a fair amount of time into the game to try out the Boss Rush Mode (pretty self-explanatory) and the Survival Mode, where you have but one ship to spare. Additionally, your high scores can be posted to Nano Assault EX's online leaderboards. Here your friends and total strangers alike can compete for top times and best honors as they vie for first place. The controls of Nano Assault proper were quite satisfactory to begin with, but Shin'en went the extra mile with the controls of Nano Assault EX. While you can still use the face buttons to direct your fire (X shoots forward, B shoots backward, A shoots right, and Y shoots left), the addition of Circle Pad Pro support allows you to simply use the second Circle Pad to control the direction of your shots. The two control methods can be cycled through at any time through the pause menu. Just think-- your insides have this going on. Nano Assault EX is a gorgeous game, but that is simply to be expected from the brilliant tech-heads at Shin'en. They know Nintendo hardware well, and they constantly show they are masters at their craft. The 3D effect in Nano Assault EX is positively divine, and helps with knowing when and where to dodge oncoming bullets. Not all is well with the technical presentation of the game, though. Dark areas have some ghosting issues when the 3D is turned on, and the frame-rate can have a few hiccups of sorts as you play. It's nothing of a deal-breaker, but something to note. Dealing with sound, the voice acting that is present (a female computer voice) is done well and fits the mood of the game well. The music is also superb, with some ambient tracks and some dramatic space opera-sounding themes to bust some viruses to. Nano Assault EX is another fine offering from the folks at Shin'en. This is an updated, enhanced game that is well worth the $14.99 price tag for those who haven't played the retail original. For those that have, there's not too much of a reason to return to the microscopic world that this game contains. Still, the additions included with Nano Assault EX make for a game that is packed with content, glorious to look at, and most importantly, fun to play. Now, we know what you're thinking. 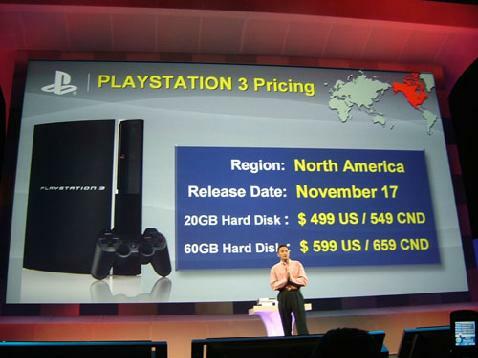 1) Sales between the PS3 and 360 are very close, so we cannot say with a straight face that the PS3 beat out the 360. That's not what we mean when we say Sony's system beat out Microsoft's, and 2) Saying a gaming system won over our hearts is incredibly lame and something a fan-thing would say. We are most certainly not fan-things at SuperPhillip Central, but saying "won over our hearts" was the briefest way to put that the PlayStation 3 was a console we used to not care about to one that we now cannot get enough of. To go back to point #1, what do we mean then when we say that the PlayStation 3 "beat out the Xbox 360"? That's an excellent condition, so let us elaborate. 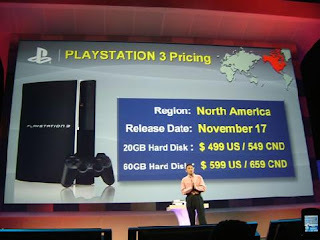 The PlayStation 3 started off with plenty of ground needed to catch up with its competitors, the Wii and the Xbox 360. The infamous "Five hundred and ninety-nine dollars" is a phrase that will live on in the echoes of time. Sales were sluggish, games were few and far in-between, and PlayStation fans kept playing the "Wait for *insert game here* for sales to improve." Pretty much what the Wii U and Vita are experiencing now. However, things finally improved. More games came out from Sony and third-parties, the price was lowered, and new features came to the PlayStation 3 seemingly every month. A day that will live in infamy for Sony fans. Let's compare the first-party output of both Sony and Microsoft. This generation alone Sony has published a staggering amount of new IPs, far more than their competition. That's absolutely delightful to see in an industry where sequels and stagnation are commonplace. We've seen epic and/or entertaining new franchises like Uncharted, inFamous, Resistance, Heavenly Sword, PlayStation All-Stars Battle Royale, ModNation Racers, and our personal favorite, LittleBigPlanet. However, Sony also brought back a lot of their legacy franchises such as God of War, Gran Turismo, Ratchet & Clank, Sly Cooper, Killzone, and Wipeout, to name a handful. These games blow away what Microsoft offers, and we're not talking sales. We're talking about how Sony has a wider and broader range of titles in varying genres than Microsoft, who, for a while now, has primarily stuck to shooters, Kinect games, and racers. The point here is that Sony has really stepped up their first-party development with the PlayStation 3, offering familiar faces and franchises and a lot of innovative and intriguing new ones. Then there's the excellent third-party support, something that Sony platforms have always had. Publishers like EA, Activision, Ubisoft, Bethesda, Capcom, Konami, Square Enix, Sega, Namco Bandai, THQ (R.I.P. ), and Take Two have delivered fantastic titles for the PS3, some being exclusives, such as Metal Gear Solid 4, Ni no Kuni: Wrath of the White Witch, and Valkyria Chronicles. Even games that weren't exclusives were enjoyable to play like Batman: Arkham City, Saints Row: The Third, Sonic Generations, Mirror's Edge, BioShock Infinite, Metal Gear Rising: Revengeance, Street Fighter IV, Marvel VS. Capcom 3, Dark Souls, Borderlands 2, and many more. We also enjoy PlayStation 3 more than the Xbox 360 for the reason regarding online. The 360 obviously has a better online service than the PS3, but at the same time you have to pay to play online and use various services such as YouTube (seriously) if you want to take your 360 online. With the PS3 you have free online, and you have enough features that make online play entertaining and engaging. We hope that the PlayStation 4 will remain free for online gaming, but after seeing Microsoft's success, Sony might decide against that. 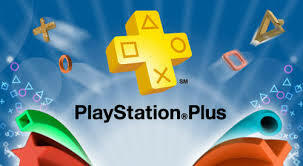 Regardless, we're seeing an awesome premium program from Sony with PlayStation Plus. This not only grants subscribers with early access to game betas and demos, but every month it also delivers free games on a consistent basis. We're not just talking PSN games or Minis, either. No, we mean full games like Uncharted: Golden Abyss (Vita), LittleBigPlanet 2 (PS3), and Mega Man X: Maverick Hunter (PSP). PS+ is an awesome contribution to gaming, and we're excited to see where it goes with the PlayStation 4 and future PlayStation products. 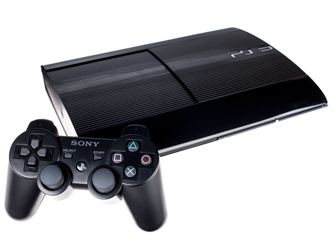 It is for these reasons why we at SuperPhillip Central figure that the PlayStation 3 was our favorite high-definition console this past generation, and the one which turned our opinion of the system around 180 degrees. From the excellence that is Sony's first-party output to PlayStation Plus, Sony has really pulled a miraculous comeback with the PlayStation 3. With the PS4 coming down the pipeline, the future for Sony looks bright in the home console market. By far the biggest game announcement from this morning's Nintendo Direct was a direct sequel to A Link to the Past, one of the best games of all time. If you currently own a online-capable 3DS, hop online to the Nintendo eShop and download this very trailer from there. You can then watch it at any time and in glorious, glorious stereoscopic 3D, seeing why this is one of those games made for the Nintendo 3DS. 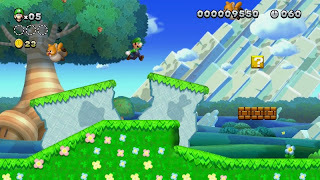 If you've been living under a rock or do not follow gaming news regularly, then let us enlighten you on New Super Luigi U, downloadable content that is coming out this summer for the Wii U launch title New Super Mario Bros. U. 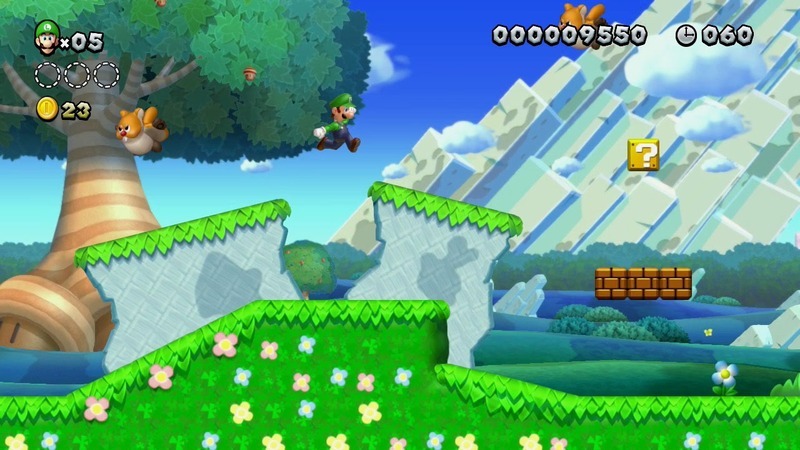 The DLC will be single-player and star a Luigi that can jump higher, but has bad stopping power. 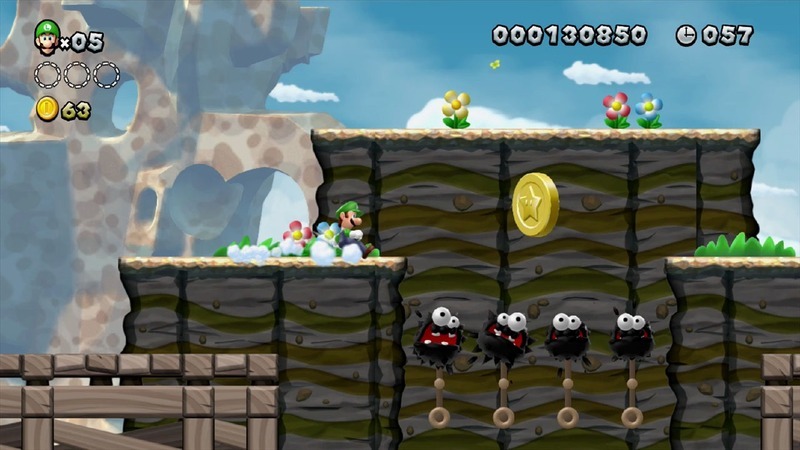 80 new levels will be available for those who can't get enough 2D Mario (like us) to enjoy. 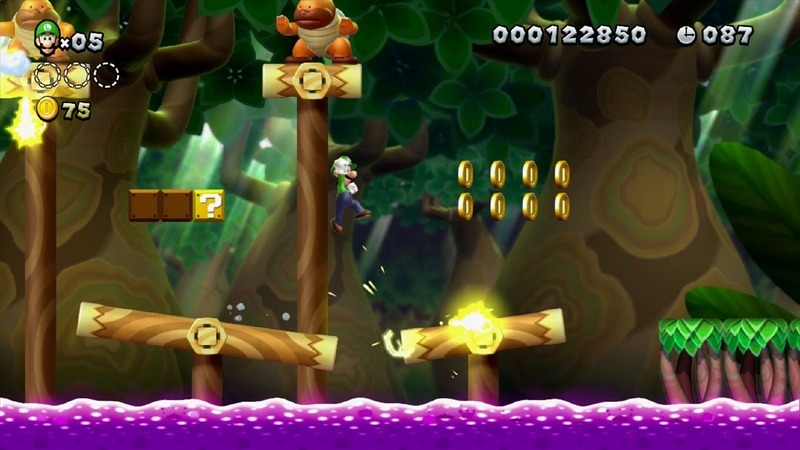 Along with the other Mario games represented at this morning's Nintendo Direct, a new game was announced. 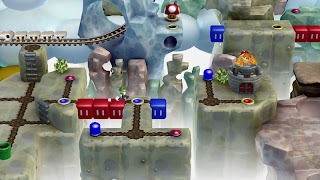 This new entry in the Mario Party series has a lot of familiar elements, new quirks, and a return to the more classic style of Mario Party rather than the one showcased in MP9. Take a glance at these screens and hope that online play will be confirmed, or at least local play with just one game card needed. There seems to be no more perfect platformer from the Wii to put on the Nintendo 3DS than Donkey Kong Country Returns 3D. 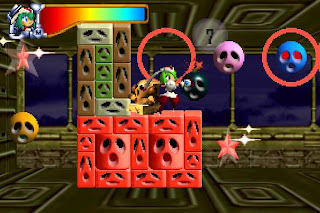 The reason for this is how Donkey and Diddy Kong move from the background to the foreground and vice versa, showcasing the depth of the stereoscopic visuals. Donkey Kong Country Returns 3D is being developed by Monster Games (Excite Truck, Pilotwings Resort) and will release near the end of May for North American 3DS owners. We at SuperPhillip Central will be posting the majority of the new trailers from this morning's Nintendo Direct. The first trailer is from Mario & Luigi: Dream Team, due out in July for European 3DS owners and August for North American 3DS owners. The game's subtitle relates to how Mario enters Luigi's dreams to solve puzzles and progress through the game. We haven't had an interview in a while at SuperPhillip Central, but this next one is something special. I, SuperPhillip, am the head of this site, but my main job is being a college student here in St. Louis. It's my goal to specialize in game design as a fulltime job. Throughout my college career I've met some interesting people, but Ben Triola is one of the more intriguing characters I've met. He is a member of Happy Badger Studio, conveniently located just outside the St. Louis city limits. Now, I don't know about you, but I was relieved that this group was made up of happy badgers, as the only badgers I've known in the past were really mean drunks. In all seriousness, I chat with Ben about how Happy Badger Studio came to be, we talk about the studio's Kickstarter and game, we converse about how easy (or hard) the game acceptance process for Apple platforms is, and advice for those who wish to enter the industry. It's a revealing look at an indie studio homegrown in SuperPhillip Central's hometown. I hope you enjoy reading about Happy Badger Studio, Something Fragile (their Kickstarter game), and simply seeing how savvy Ben is. name any off hand? What is your background? What made you want to enter the industry? 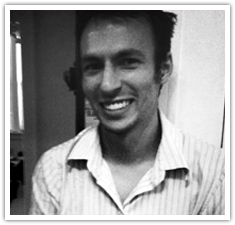 Ben Triola (BT): I’m an interactive designer / problem solver at Rampant Interactive, as well as a game designer at Happy Badger Studio. Favorite games...really hard question. To name a few: LoZ: Link’s Awakening, Utopia (Intellivision), Reactor (Arcade), Toe Jam & Earl, Mario Kart DS, Bastion. I started collecting games as a teenager, and began playing a lot of the games I missed out on as a child. It was somewhere around that point that I started getting interested in game design. SP: Was there ever one game that you made go, “Okay. I HAVE to be in this industry now”? BT: I don’t really think it was one specific game. I think it was more that as I started to collect, I got a glimpse of games and how they changed and influenced each other over time. That and reading about the early history of game design - I had this feeling of wanting to be a part of it. Obviously it’s too late for me to be a part of the Atari 2600 design team, but I feel like there’s still a lot of unexplored territory in games. SP: Not only do you design games with Happy Badger, but you also teach at Webster University here in St. Louis. What made you want to go into the teaching side of things? BT: I don’t know - I like trying new things, and I’m passionate about game history, so I guess it just made sense. I think it’s really important for gamers to have an understanding of where things came from. I’m also one of only a few people in the area to have all these systems and I enjoy sharing those experiences with students. SP: Speaking of Happy Badger Studio, how did it come to be? BT: We encouraged some friends of ours to start a game studio, and Rampant Interactive would partner with them to produce and market the games. We completed one game all together, and started on some others - but ultimately their group got busy with other things, and we wanted to keep moving forward at a faster piece. 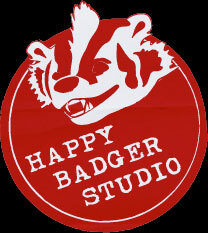 They ended up selling Happy Badger Studio to us and now Rampant Interactive and Happy Badger Studio are under one roof. SP: What games or people within the industry have inspired your studio, staff, and games, if any? BT: I think we take inspiration from a lot of different places. We’re really into games that are explorative and experimental. We take inspiration from Atari games, because many of them didn’t build on existing genres, but staked out new ground. We take inspiration from indie games too, like Sword and Sworcery, Bastion, and others. I’ve been to GDC twice now, and that’s a big inspiration as well - I really like the experimental games session, and hearing from developers like Die Gute Fabrik. SP: What is a typical day at Happy Badger like? BT: I don’t know if there is a ‘typical’ game - our time is split between Rampant and Happy Badgers, so it can get a little crazy. We try to reserve Mon-Wed for client work and Thur-Friday for games, but inevitably they bleed over and we’re submitting games to Apple on Monday and fixing client problems on Thursday. And there are a lot of times that we use weekends or evening to work on games too. We really like the “Jamming” model of making games, so sometimes we’ll just see how much of a game we can complete in a Saturday. SP: What programs do you use to make your games? BT: We use a lot of middleware, like Stencyl, Game Salad, and Corona. 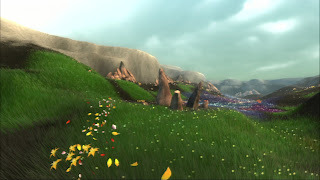 We’re also looking into Unity, and UDK, as well as native development for iOS. SP: How complicated/simple is the process of getting your games accepted by Apple? Are there many hoops to jump through? Is it worth the time and effort? BT: I think the process is intentionally maddening. There’s a number of different certificates and profiles you have to generate before you can even start - and submitting the game is always a challenge that always seems to take several hours. So yes, there are a lot of hoops, but it’s worth it, and it probably helps cut down on the crap games in the store. It’s worth it to have thousands of people play your games. As far as financially worth it? TBD. 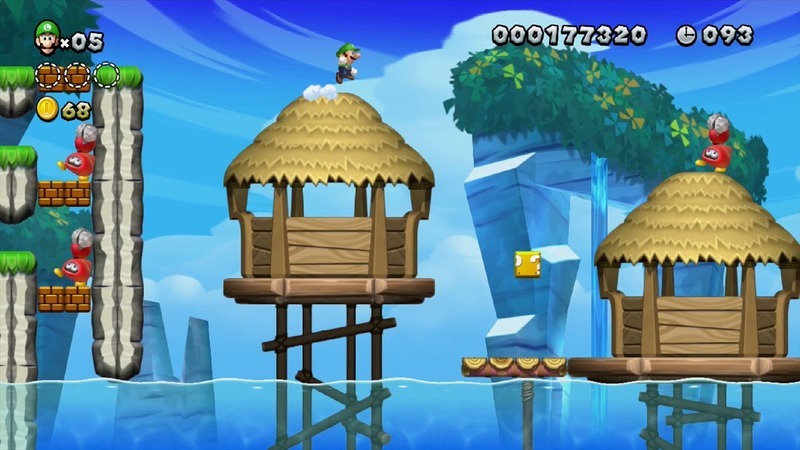 SP: A lot of indie developers have found success on home consoles. Has Happy Badger thought about developing downloadable games for such platforms like the Xbox 360, PlayStation 3, and so on? SP: There has been criticism of smartphone and tablet gaming. Some view the majority of content on places such as Apple’s marketplace as shallow experiences. What is your opinion on that? Do more complicated and involved games like the ones seen on dedicated gaming systems have a place on smartphones and tablets? BT: I think they do - Sworcery and Bastion both have a good deal of depth and are great tablet experiences. But I also don’t think mobile games need depth. Sometimes its fine to have a game that doesn’t require hours of dedication. I welcome lite gaming, and I think mobile is the perfect platform for it. Take Canabalt or Tiny Wings. These games are simple, but they’re a hell of a lot of fun. SP: Can you tell us about your Happy Badger’s current Kickstarter? What is the game you want to make? What is the cash goal you’re trying to reach, and how close are you guys to reaching that goal? BT: With 8 days left we’re at about $7,000 of our $18,000 goal. We really want to make Something Fragile - it’s something we started at the Global Game Jam, and after the response it got we feel like we need to finish it. It’s a poetic game that deals with love and loss - you’re a character that’s carrying a heart; you have to protect it, but sometimes you have to set it down or put it in harm’s way to move forward. I think it’s something a lot of people can relate to. 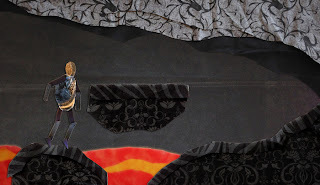 The game also has a striking visual style - all the art is cut out of fabric and stop motion animated. SP: What are your thoughts on Kickstarters? How has that changed the indie game development scene, if at all? BT: It’s definitely been an experience - and whether or not we get funded, I’m glad that we decided to do it. I think it’s great for indie games - it’s helped some games get not just funding but an audience as well. I think there’s still room to grow, and it could have a better discovery system, but I think its been positive so far. SP: This is a purely hypothetical question. If you and your colleagues at Happy Badger had an unlimited budget to make whatever sort of game you wanted for any platform, what type of game would it be and what platform would it be on? BT: Wow, I think there’s so much that we would do - I definitely want to make some console games - but one concept that I’m really excited about is shared world games on mobile. I really want to explore this area. Shared world is different than MMO in that everyone is still playing what is basically a 1 player game - but the world is shared amongst all the players, and there are global events, and ways players can affect the game world for everyone. SP: What advice do you have for people interested in entering the game development side of the video game industry? BT: The biggest advice I can give - if you want to make games, start making them now. Just start doing it. The tools and resources are out there. Programs like Game Maker and Game Salad make creating games incredibly accessible. The only way to become good at it is to start doing it. SP: Is there anything else you would like to say to the readers of SuperPhillip Central? BT: I’ve probably talked enough. I would just say to people, keep playing games. And try something that maybe you wouldn’t normally try - first-person shooters can only entertain us for so long - it’s worth seeing what else is out there. Our huge thanks to Ben Triola for his time. If you wish to put some money into Something Fragile and back the game, you can do so at this link. 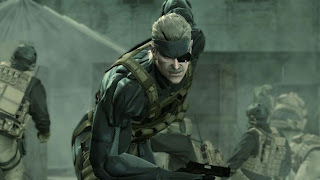 The link also shows a video about the game and possesses lots of cool information. Remember that your money is only spent if the Kickstarter reaches its goal. Otherwise you will be refunded how ever much you put in. The game will be made regardless, but if the Kickstarter succeeds, then Happy Badger can make Something Fragile their main focus and push it hard. Did you know that this month is Stress Awareness Month? Did you also know that today is Stress Awareness Day? If not, then you can see that SuperPhillip Central is also a great source of learning and entertainment. To go along with Stress Awareness Day, SuperPhillip Central has a list of games that are nice and relaxing for players. These are titles and series that are soothing, will lower your blood pressure, and will put you in a nice state of comfort as opposed to raising your stress level. Our first series is that of Animal Crossing. The series basically sets you to play at your own pace, slowly paying back your debt to Tom Nook, collecting new furniture to spruce up your home, chatting with your animal neighbors, fishing, catching bugs, and digging up fossils. Perhaps the only stressor here is coming back to your town after a month's absence and seeing it covered with weeds. 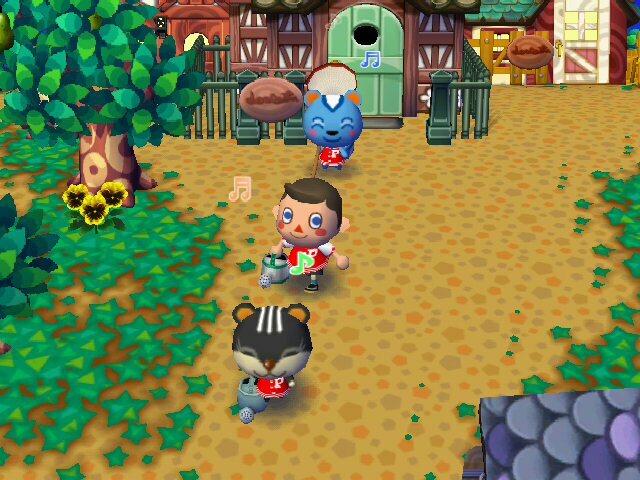 The upcoming June release of Animal Crossing: New Leaf for the Nintendo 3DS offers the ability to play as the mayor, controlling your village as you see fit. 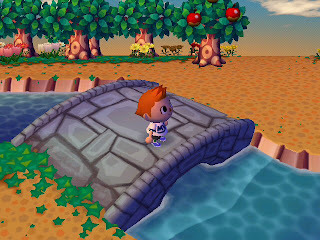 Animal Crossing is a delightful series that is nice and relaxing to play, especially with friends. 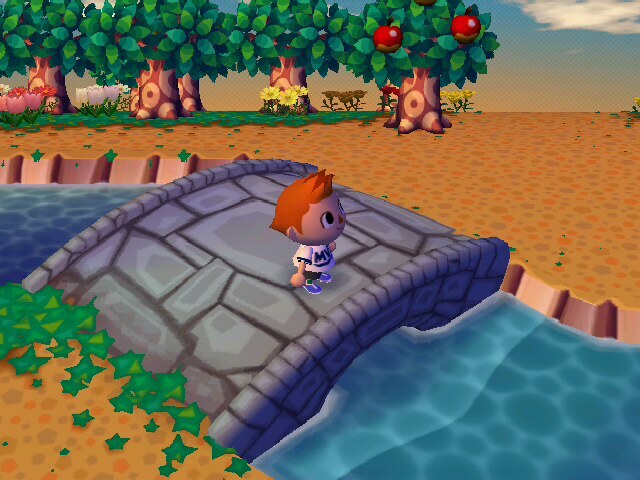 Let's focus on a franchise similar to Animal Crossing. 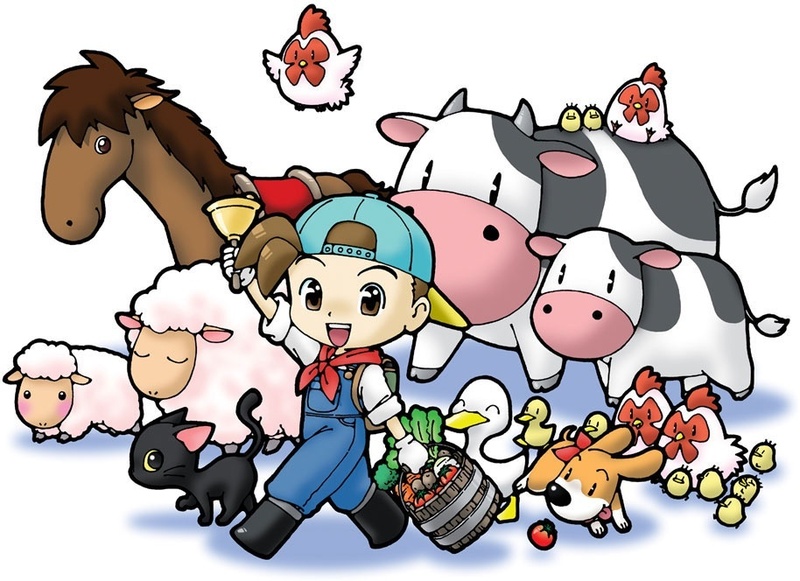 It's a series that has spanned multiple consoles from Nintendo platforms to Sony systems, Harvest Moon has its main focus as a farming game with quirks that make the games so lovable. Such quirks include raising livestock, conversing with the locals, and eventually settling down and getting married. It's your overall duty to take a dilapidated farm and turn it into one bustling place of agriculture. Let your worries and cares fade away as you milk old Bessie, gather materials, and water your crops. Voted by SuperPhillip Central as the best new IP of this past generation, LittleBigPlanet encourages creativity and fosters an environment for unbridled entertainment, either alone or with friends. Playing through the happy-go-lucky craft-filled world of LittleBigPlanet invokes a warm and happy feeling, and the franchise is endlessly charming. The only real stressor to the LittleBigPlanet series comes from the optional task of trying to ace all of the levels-- that is, beating every platforming level in the game without dying, so avoiding doing that when you want to relax is recommended. 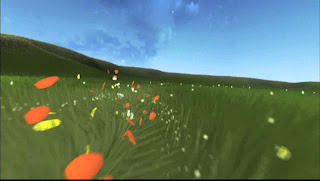 A soothing PlayStation Network-exclusive game where you tilt the PS3 controller to guide the wind on flowers to liven up fields, Flower is a title that is a lethargic experience. The team behind the title, Thatgamecompany (Journey, Fl0w), wanted to present players with a positive feeling. They definitely succeeded as the game is a breath of fresh air, and one that will calm even the most agitated gamer. The Brain Age series challenges your brain with short sessions of math problems, sudoku, memory tests, and much more to keep your brain active. The series, based off the research of Dr. Ryuta Kawashima, is one that can played in small doses, and engages your brain. The games try to enhance certain parts of the mind such as recognition, memory, and concentration, which the latter is the focus of the latest entry in the franchise, Brain Age: Concentration Training. Crosswords are always a nice diversion from a wild and wacky world. Let the stress leave your body as you play hundreds of crossword puzzles, word searches, and anagram games in Crosswords Plus for the Nintendo 3DS. Even doing a crossword or word search with a timer isn't a stress-inducing experience. There's no real reward or reason to panic by taking a long time on a given puzzle. And if you get stuck on a puzzle, don't get flustered, simply use a clue to help you out. 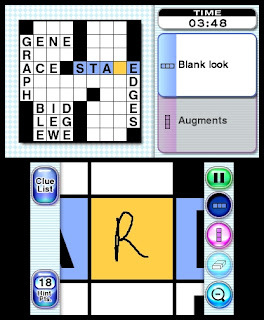 Crosswords Plus is the sequel to CrossworDS on the Nintendo DS. Both offer an insane amount of puzzles for a budget price. The Art Academy series offers finely tuned lessons divided up between parts to teach players the basics of art. You learn about perspective drawing, shading, and blending colors. The latest entry in the series, Art Academy: Lessons for Everyone! (3DS), has a multitude of easygoing lessons, the ability to share your work with friends, and a multitude of fun techniques to learn. Nothing beats going at your own pace and learning that you actually aren't as bad of an artist as you think you are. Paining and drawing via the touch screen is a fine, relaxing experience that those with an interest of art and a Nintendo DS or 3DS shouldn't pass up. 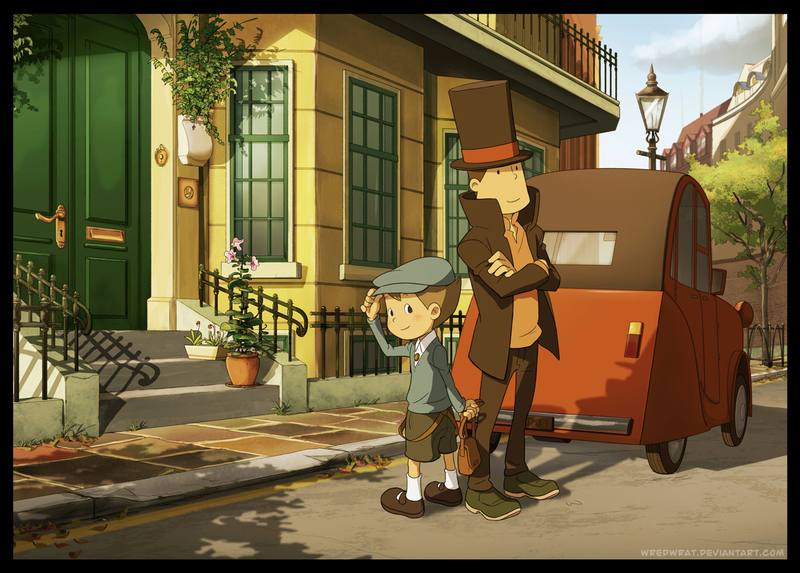 Professor Layton has seen five games release over in the West, with the latest being Professor Layton and the Miracle Mask, the first entry on the Nintendo 3DS. 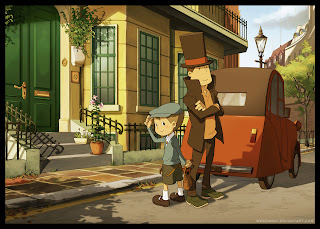 For the uninitiated, the Professor Layton franchise has you following a mysterious story usually with Professor Layton and his apprentice Luke by his side. As you journey through areas, you come across brain teasers that sharpen your logical thinking, reasoning, and processing. 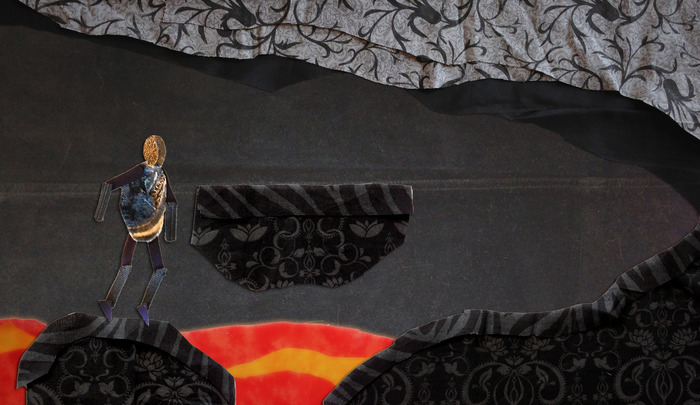 These puzzles often are given to you to advance the story once they are solved. There's nothing like chilling with a particular puzzle and eventually coming upon its solution. Grab yourself a spot of tea and put on a monocle, as the Professor Layton series is one to compose oneself. 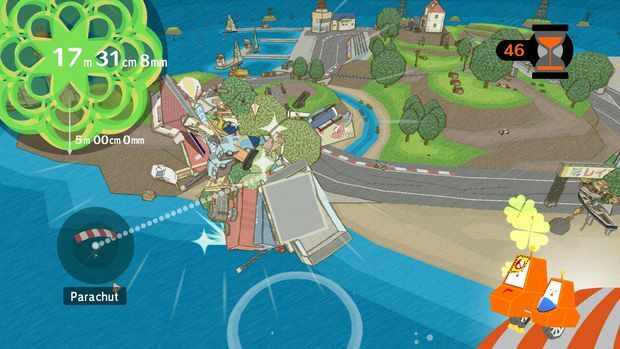 Katamari Damacy as a franchise has players rolling up buildings, objects, and even people as they try to get their ball (the Katamari) as large as possible. It's that enjoyment in rolling up anything and everything that makes the Katamari Damacy series so engaging. 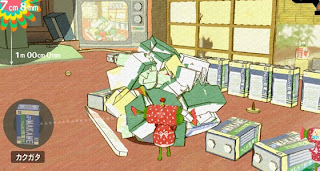 Time limits do little to aggravate players, as the joy of rolling one's Katamari beats all frustration. It's a pleasing and calming feeling, and a game series that explodes with charm. 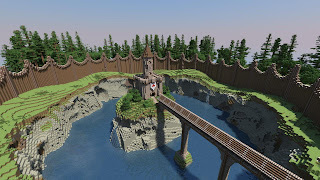 In the procedurally generated world of Minecraft, you are let loose in a world with no real goals in sight. All you need to do is build and chip away blocks to create whatever you wish. You have total freedom. 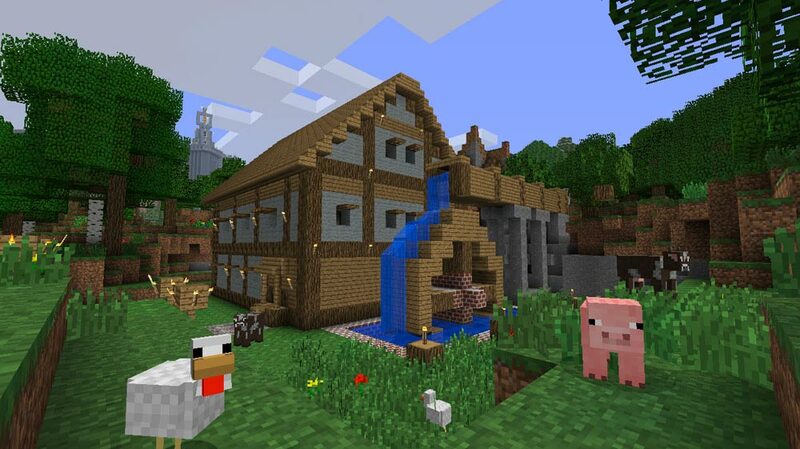 Speaking of freedom, playing the Creative mode of Minecraft allows players total freedom from worry. You build, you chip away, and you fly. 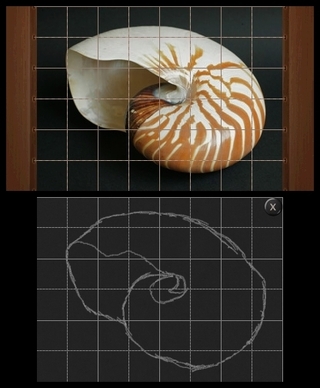 You can make masterpieces of maps, buildings, and other objects. The stuff that players have done is truly sensational. The relaxation part of building and venturing around the game world is why Minecraft has a place on this list of soothing games. Those are ten relaxing and soothing games we thought of. Did we miss any of your favorites? What games put you in a state of calmness, a moment of repose, or a feeling of relaxation? Post your ideas in the comments section below.